The May Flower Moon is coming up at the end of the month. 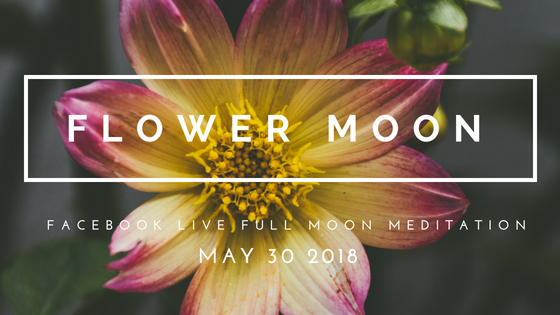 To celebrate, you’re invited to join our Facebook live meditation on May 30th, where we’ll call in the energy of the Full Flower Moon to nurture our own blossoming. Flowers are a beautiful symbol of female sensuality and sexuality. Like a flower when it blossoms from a closed-up bud to its fully-unfurled glory, our sensuality can only flourish in openness and full expression. We all know the ways that female sexual energy has been exploited, punished, and policed in a patriarchal world. The flowers blossoming in gardens and fields in the Northern Hemisphere this time of year remind us that it’s in openness that we reach our full purpose and beauty. Weave flowers into wreaths for a friend, a lover — or yourself! Tune in with me live on Facebook Wednesday, May 30th at 5:45pm EST / 2:45pm PST / 10:45pm BST / May 31st 7:45am AEST to meditate with May’s Flower Moon. And if you can, have a flower with you for the meditation! We’ll gather virtually to invite and celebrate the flourishing of fertility, sensuality, new life…and our own blossoming. Click here to sign up. May the Full Flower Moon bring you regeneration, abundance, and pleasure!